Jane Brocket is an internet crush of mine. Her Yarnstorm was the first blog I stumbled upon many years ago. I didn't know what a blog was and I have no clue how I got there but I fell in love with her tulip photography and writing about all the domestic things she loves and does. 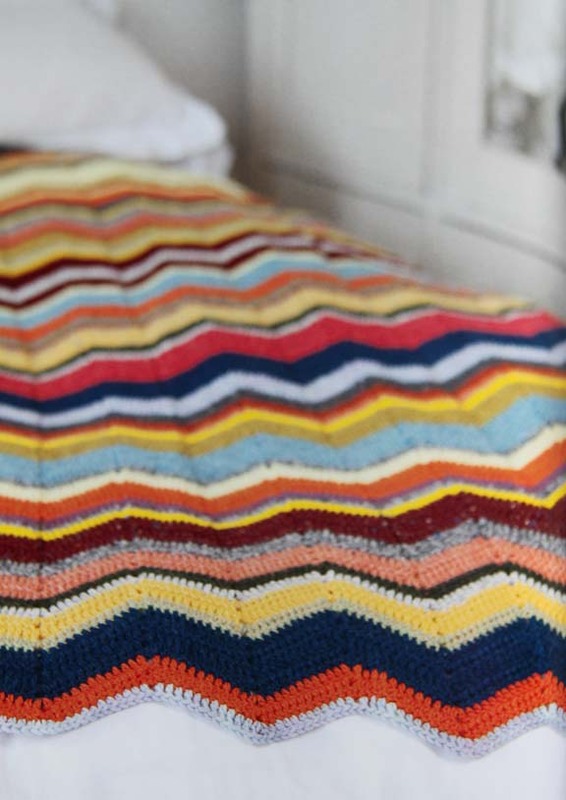 Reading Jane's blog gave me the feeling that I had found a soul sister - someone else who shared my passions, love of color, handmade things, family, wine, chocolate, baked goods, and travel. I have never met Jane but we have written back and forth a few times. I admire her and what she does and how she writes about knitting, baking, and more and her colorful photographs. 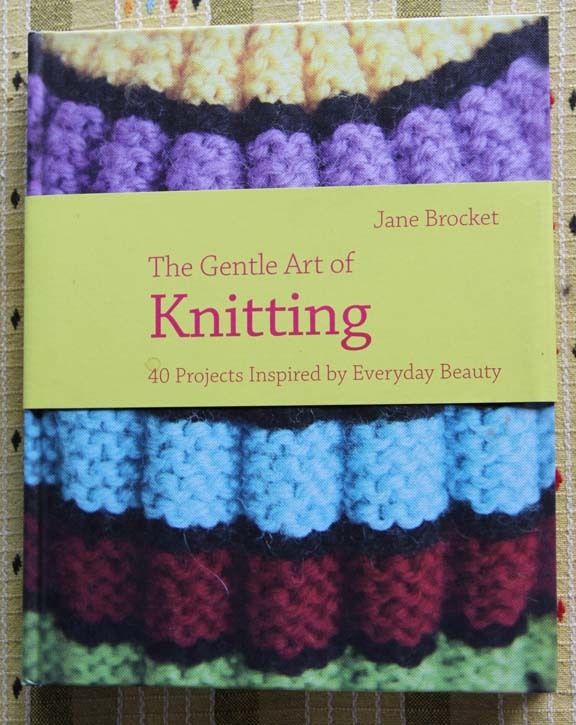 Jane has written several more books including one on quilting (The Gentle Art of Quilting), some children's books, a baking book, a kids project and games book and now for all of us knitters - a knitting book called The Gentle Art of Knitting. It is lovely. Full of beautiful photos and colors and funky projects that are "vintage" looking even if when you knit them they are brand new. 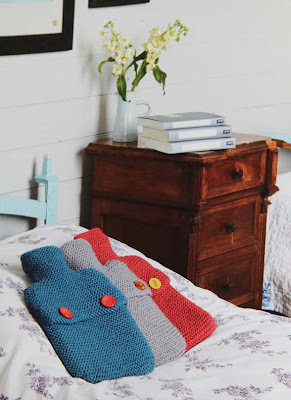 Other fun retro projects include the obligatory "hottie" or as we say in the states "hot water bottle cosy." "Hottie" sounds much more fun doesn't it? 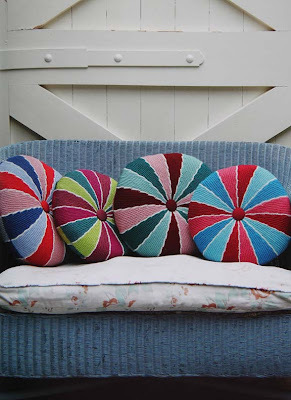 I love the retro feeling "Wheel of Colour Cushions" which are made using a short row technique. 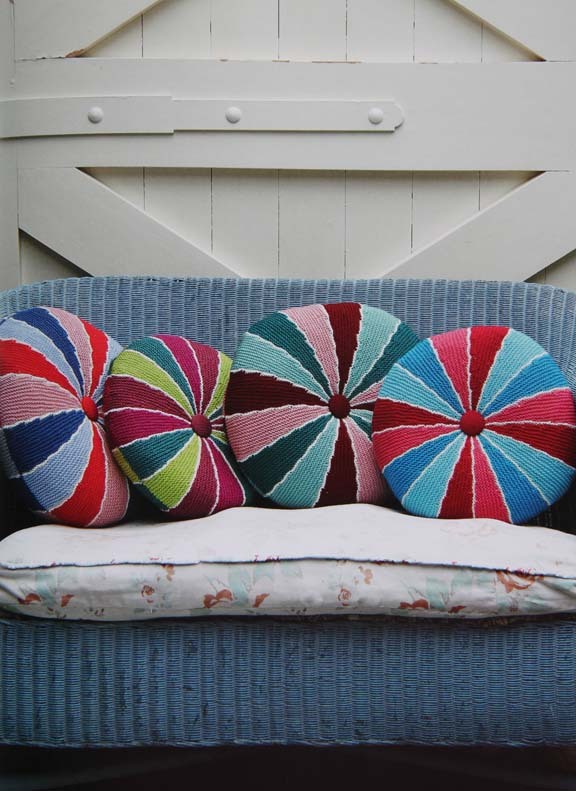 My Aunt Boots used to have pillows like this on her sofa (she called it the settee). Are they not fab? I've always had a penchant for luxurious handmade coverings for wooden hangers. 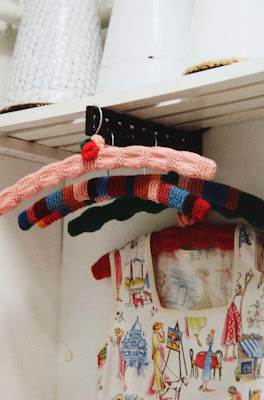 How decadent to actually cover a hanger with handknit stitches. What a great way to treat your clothes. And what a nice shower present these would make. It's pretty hard to resist the cuteness of Jane's knit "bunting." Although this isn't really an American kind of thing, it sure is cute. It would make great Christmas garland. Great photo - love all those plates on the shelves. Each project is introduced with a page of text including her inspiration and back story to the pattern. These are my favorite parts of her book. Most publishers give an author a paragraph to wax on about the project. At least this publisher had the sense to let Jane do what she does beautifully - write about handmade things and the act of making them. This is not a sweater book although there is one easy to knit basic design. 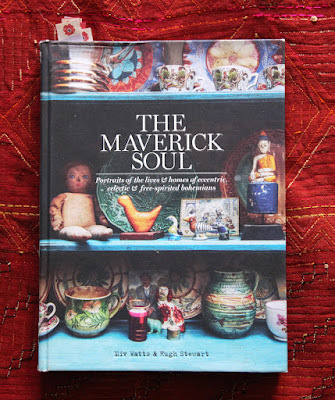 There are a few scarf, sock, hat and glove patterns but what this book really celebrates is the handknit object for the home. The projects are vintage-inspired and fun and would make great gifts for the holidays. Congratulations to Jane on her latest big project. May she have many more. Answer this question in the comments section of this post: In keeping with the title of Jane's first book, What is your favorite "gentle art of domesticity" and why? Thanks for reading, as always. PLEASE LEAVE AN EASY WAY TO GET A HOLD OF YOU. Contest ends Wednesday November 2nd at 11:59 p.m. Contest closed. The winner was Kristin Farrell. Congrats! Your book is coming from the UK. I love knitting things to keep my family warm. I also enjoy baking bread. I don't know if splitting wood counts as a "gentle art" but knowing I will have wood for the winter to keep our family cozy gives me a great feeling. Right now my favorite "gentle art" is knitting, but I began making things with needle, thread & felt at an early age. Sewing has been my constant "gentle art". And then there is cooking and baking. All offer a creative outlet, provide comfort to others and bring people together. The next generation in my family is also carrying on these traditions and values. Thank you for spreading the word as well. My current favorite is knitting socks. I enjoy self-striping yarn. The surprise in the pattern makes me smile. My other favorite is cooking meals so we can enjoy dinners together! For me, baking bread, cooking, and knitting are my favourites. There is nothing like a house filled with the smell of baking bread! And I love taking my time and cooking a beautiful meal for myself. Top it all off with knitting and I'm a happy gal. I love baking shortbread- trying different flavor combinations. it's fun to have something fresh-baked to eat and share. Well, knitting is the top of the list ... but really domestic is my baking! I love to bake (not so much on cooking) ... especially ooey, gooey treats for my family! It's hard to pick a favorite. I love to sew and have especially loved making wedding quilts for my children as they get married. I also always have something on the needles to knit and love the portability of knitting and the feel of the yarn in my fingers. What a wonderful giveaway - thanks so much! I love baking bread--the method I use is so simple, but the taste and texture are wonderful. It gives me joy to make something so tasty. while I love baking, I do love knitting, even though right now nothing is working out. Really magical autumn day...chili cooking on the stove, finishing a knitting project for one of my sons while their dad helps them carve pumpkins in a backyard filled with orange and gold leaves. A wonderfilled moment of domesticity! Aside from knitting, I would have to say that preserving is my "gentle art". Not sure if most would class this as an art form, but I sure do, especially when I see beautiful jars lined up waiting for snowy months. I love them all! I currently have several quilts, knitting projects, Halloween costumes, and crochet projects in the works. Do I have to pick a fave? I guess if pressed, I would say it's a tie between hand quilting and knitting...such gentle, relaxing, meditative, creative, productive, artistic ways to pass time. Definitely knitting, although I find that the longer I knit (about 5 years now), the more open I am to other crafting. Knitting takes A LONG TIME, and so other crafts seem to be easy in comparison. It's a lovely, unexpected bonus that I received from my favorite hobby. I am a stay-at-home mom so domesticity is my cup of tea! I love keeping my home - even though it's not always the cleanest or most organized! I love the busyness of family life when the dining table is covered with school work and folded laundry, lego guys and other random stuff. As for the Art of Domesticity - I'd say my favorite is any of the creative/expressive things that I do: Knitting, sewing, piano playing, writing, crocheting, cooking, etc.. I choose all of it! I became obsessed with canning and preserving this summer and fall! It feels so domestic to have a pantry stocked with lots of different kinds of jams, sauces and pickled things to give as gifts and enjoy through the winter. I also love knitting - a craft I've practiced for over 40 years now. This is terribly old-fashioned, but I love hanging things out on the clothesline to dry! I feel the most domestic when I am kolding warm laundry and have a pot of soup simmering on the stove. Bring on the snow! Hmm. That's hard. I find enjoyment in so many of the home arts. Since I sew for a living, I'd have to count that out. It can be too stressful! I think my favorite, right now, would be cooking. I love taking a recipe I've found and using items from my pantry to make it mine. Hands-down, the answer is knitting. But a close second is baking cookies with my daughter on a snow day. Aside from knitting, I really like doing the laundry. A friend of mind thinks I must have been a laundress in a previous life. I even learned how to fold fitted sheets from Martha Stewart's website, just for "fun". I couldn't choose just one gentle art that I love the most- knitting in itself is wonderful, and in a way, it has taught me to be more generous with my time as well as the fruit of my labors. But I also love baking cookies, preparing a meal for my husband and I to share...my personal list goes on and on. Domesticity can be a lovely thing! I'll join in with the others to say that my favorites are: making soup, baking bread, and hanging clothes outside on the line. Thanks Kristin! That is a hard question. 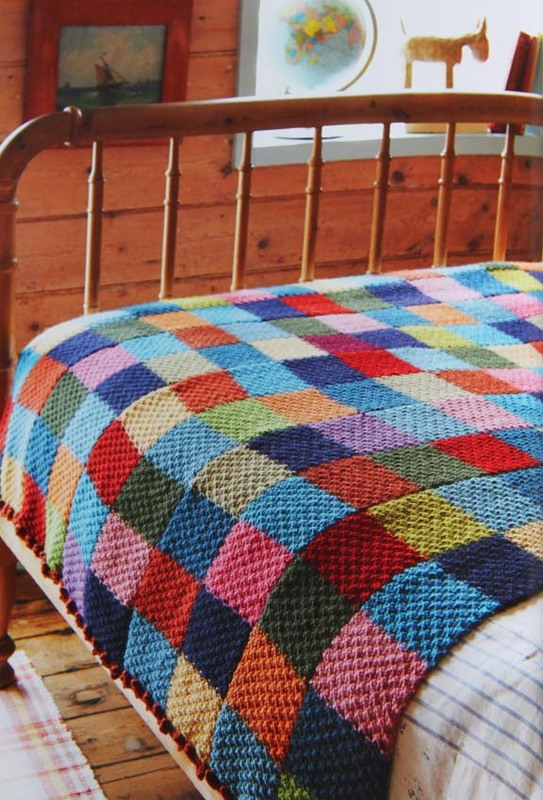 I have been a knitter my whole life, and enjoy knitting, crocheting, and cross stitching as a way to relax. But my home is filled with orginal art work by me and my artistic friends, so from a domestic point it would be art. I tend to give away my needle crafts. You'll laugh but I love hanging clothes on the line and then pulling them off while they're billowing in the wind and smelling of grass and sweet air (I live in a VERY rural area). This always leaves me smiling. I just love the "gentle art" of caring for my family. Creating a loving and comfy home makes us all happy. Like so many others have commented, I enjoy knitting, cooking and baking. But I think my favorite thing to do is curl up and read a good book. This is a strange one but lately I have really liked mending my husbands jeans (he is a dairy farmer). I also love to knit and sew and bake. Last night I was looking at my copy of your book Color by Kristin to get ideas to embroider on some wool purses I am making. I love reading about your farm and your knitting. Thanks. Cooking for family and friends definitely comes first on my list, but making up the bed with clean, fresh, line-dried linens and knitting would tie for second! I would have to say knitting socks while a fire blazes in the fireplace with a lovely scented candle giving a wonderful aroma to the room. Wow, I was really stunned to read that negative piece about Jane you linked to. This is how far we women have come, to knock down another woman's choices? Pfft. Well, Jane's certainly gotten more book contracts since that piece ran, so she's not speaking into the ether. Anyway, my favorite thing is sewing clothes for my son because he appreciates them so. He refuses to wear store-bought pants because I sew his pants with nice deep pockets and finish the seams so they don't irritate his skin. Personally I prefer knitting over sewing, but my son's hugs over some simple corduroy pants can't be beat. Quilting is my favorite, because it fits every time I make a quilt. I just love it! Baking used to be my favorite "gentle art". However, too many calories later, I've succumbed to knitting. Hiding my Yarn-Stash and keeping track of The Elderly "ELVES" is a "domestic" as I get! While I love to knit, I have recently fallen back in love with baking. Something about the smells of treats in the oven makes me happy. Baking is my gentle art along with knitting and quilting. The art of creating just calms the soul. Knitting, spinning and sewing are my favorites, and in that order. This book looks wonderful - thank you for bringing it to my attention! For me, it would be the Gentle Art of Laundry. I'm not particularly domestic (read I keep a messy house!) but I enjoy washing and hanging out the clothes and then putting them away ready for use. Knitting, most definitely, is the nicest domestic art I know of. Making bread, trying new recipes for scones, gardening, watching sunrises....all gentle projects that calm my soul. I always have been and always will be first and foremost a knitter. I took up spinning so I could have more yarn to knit. Perhaps my second love is bread baking. Spinning a beautiful roving of Corriedale or Merino is my gentle art of domesticity. As I'm spinning I can plan what color to dye the yarn and then what I'm going to knit. For me, at the moment, the gentle domesticity is heading to the barn twice daily to milk my goats. Milking a goat is as soothing and sweet as spinning on a wheel! I have many things I like to do that fall under the "gentle domesticity" category. Making a dessert from scratch each weekend (even though I don't eat it!) is one of my favorites. My favorite "gentle art" is bread baking. Knitting is my gentle art of domesticity. I'm not good at too many other domestic arts. Knitting makes me feel artistic! I just read most of the comments, and I think they are all in the same spirit, and that spirit is home and comfort. Domesticity also connects us to our past in some way. How many women have mended their husbands pants, or known their child would have warm feet all day because of the socks she knitted. I can't choose between cooking or knitting or mending, but I love the feeling of taking care of my children in the way that my forbearers would. I love love to knit but baking and raising a vegetable garden would have to come first. Working full time as a busy nurse leaves little energy and time to do a lot of any of these but they all renew my spirit when I do. Knitting is my favorite gentle art, but making a big pot of soup to have by the fire is right up there. I love to cook big pots of comfort food especially on a warm snowy day here in Indiana. Cooking is by far my favorite "act of domesticity". My mother tried to teach me how, but I didn't enjoy her style of perfection in the kitchen and it wasn't until much later that I experienced the satisfaction of nourishing my family with a good, home cooked meal. I always enjoy your recipes! My gentle art would definitely be knitting, I consider that "my" time. I also love to make stews, soups and casseroles, I am not a great cook and don't enjoy a lot of cooking, but making a stew, soup or casserole makes the house smell so good and gives everyone a warm, cozy feeling of being cared for. I love "home-keeping" instead of house=keeping. It seems more personal, making a lovely home for my family ...so much more than just cleaning,and cooking. It means hand=knits and soups in the winter, and flowers in the vases. Everything that makes a house into a home. I love knitting most, but I also enjoy crocheting, sewing, anything else of that sort. I would LOVE to knit those things. I enjoy kneading the dough to make the bread. And I love to make meals from our garden produce. In the winter, sitting down to a bowl of stew with all, or most of, the ingredients grown by me, is the best. When it is cold, I pull the wool throw off the couch or chair and snug under it. Sigh! I am such a domestic at heart! I love knitting and baking. My favorite is knitting. Because I stay at home I don't often appreciate that cooking and other domestic chores are an art form but I would miss them if I couldn't do them. Knowing that my family loves being at home is a great joy. I just got Jane's book for 11.50 from Amazon after finding out from her blog that it is OOP. Good to know she used your Julia yarn. Just got lots of that too. Winter may have arrived up there today but not here in the south. The Gentle Art of Domesticity at my house was always laundry and hanging it up on the line on one of those absolutely perfect drying days! Why laundry and hanging it out? It's organic , totally! The piles always grew daily with 4 sons and a daughter! I just bought a copy of "The Gentle Art of Domesticity" recently (wasn't too expensive, but maybe I got ahead of the trend for once) and am enjoying it very much. My gentle art would probably be baking, though anything I can do at home is my favorite activity! 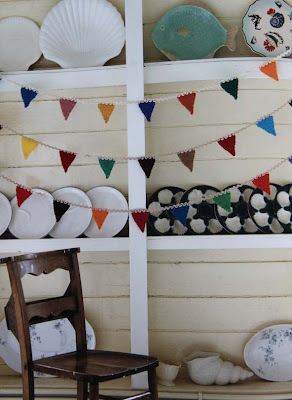 I so want to knit the bunting! I love to knit for others everything from baby gifts, scarves,hats,sweaters,etc. My second love is baking. I've been reading Jane's blog for years....and would love to receive her book. Narrowing down to one favourite is pretty tough, so I'd have to say it's a tie between knitting and rug hooking. My favorite "gentle art" is cooking and now that it's cooler I'm looking forward to making lots if soups and stews! Thanks for the chance to win this book! I don't think of myself as "domestic" at all. I'm into technology, playing with gadgets all the time (or all the time I can squeeze from my daily commitments). I teach in a public school, 5th grade, and it eats up a lot of my time ~ designing lessons, grading papers, etc. And I'm single, so I don't have anyone making demands on my time. I guess baking artisan bread, creating small batches of great soup, and knitting would classify as domestic, though, right? I'd say it's a tie between knitting and baking. My children think that I'm great at both of them and I'm not about to dissuade them. If I win, you can find me at foxleygrove [at] rogers [dot] com. I do love baking,primarely baked goods of any kind. My last two efforts went to groups and I realized how little home-baked goods people share any more. I think I will be making more from now on. I also love my knitting and stitching, but my hands don't let me do much at one sitting any more. I have a hard time choosing between knitting and crochet these days. I also love baking bread---such an under-appreciated art! As odd as it is, my favorite domestic activity is ironing. It was one of my first assigned chores as a child. I enjoy mindless ironing, and sometimes iron pillow cases, handkerchiefs and napkins. I think it must be the smell of warmed clean cotton! sarabyron@att.net SareBearKnits on Rav. My favorite domestic art changes from season to season, as it gets colder, knitting is my favorite. 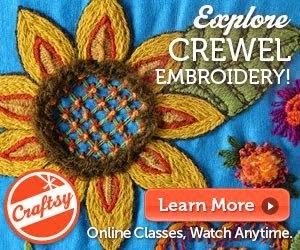 This summer, I was loving embroidery! I enjoy cooking and sharing a warm, filling, homemade meal with the family on a cool fall Sunday after a busy day of chores at home. Aside from knitting (and the occasional run at the sewing machine, I'd have to say my favorite domestic activity is arranging books in the bookcase--that or helping the kids with an art project! A runner-up would be baking challah on Friday. And I love Jane's blog. An empty laundry basket, a weeded garden, fresh sheets on the bed, dinner baking in the oven and I'm good. After a hard day of work, the gentle art of tea making. Ah, a nice cup of tea and a McVities Chocolate Digestive. Wonderful! Mine is cleaning up the house and then decorate with things that i found thrifting and dream up doing fancy things around the house.Add to the mix is that i love to sew,knit,crochet,paint,cook which is as domestic as it gets!! Knitting is my favorite. It's so quiet and contemplative for me, but at the same time it can also be done in the midst of loud and busy things around the house or out with friends. I think the times I feel most domestic are when I am cozy and knitting in the evening. My favorite is weaving. I'm even weaving with my own handspun now, very fun stuff! I was just at my local knitting store today, chatting about my memories of working at a knitting shop when I first moved to NYC from Amherst, MA. This was in the late 70s, when Amherst was still filled with hippies and I had learned to knit socks and mittens with Candide yarns and patterns. The shop in Manhattan that I worked in had a gray-haired, cigarette-smoking, raspy-voiced woman named Zelda who was able to write patterns for the sweaters that Ralph Lauren was creating and selling for 100s of dollars. Much of my job was helping Upper East Side ladies choose all of the colors for those the beautiful fair isle patterns! All these years later, I am still knitting those Candide mittens! I made a pair today for my college freshman son!! Baking is my favorite domestic art. It is very much like chopping wood - it warms you twice, especially if you knead by hand! My favorite domestic activity might be investing the time for a nicely prepared meal. I also feel calmly domestic when I can clear my kitchen counters and the dining table. They collect the droppings of daily comings and goings as well as the starts and stops of many of my creative projects. I've just found your blog am am looking forward to the adventure. Thank you. My favorite is knitting. My mother taught me and although she no longer knits, she enjoys seeing what I make. The second would be baking. I love to bake. Just today prior to reading this post I was exploring a cake decorating class. It reminds me of one of my grandfathers. He had a bakery and made such incredible creations. Great question! I have three favorites. 1) Walking the dog in the neighborhood. My dog loves the smells, and I love the area, and am grateful to live in a free country. 2) Knitting is so special and calming. I am grateful for all those who have taught me soemthing about the craft, and that I have the ability to create something with my own hands. 3) Bread Baking generates such wonderful smells, and fills my stomach. I am grateful for the food and to share the abundance of gluten with my friends and family. My favorite is sharing something creative or delicious with my children (crafted or baked) and, also, getting to share a laugh and a smile over it with them. Definitely knitting. But I have a strange soft spot in my heart for ironing shirts. . .
My favorite domestic art is ironing. Believe it or not, I find ironing very relaxing and I love the heat especially in the winter and I love the crispness of a freshly ironed blouse. I also love the gentle art of hand applique because I love working with my hands. It took 30 years of quilting to discover that hand applique was my favorite. That is also why I love knitting--again, working with my hands to create something lovely.